I am tired of throwing away bananas. I usually get a few bananas in with my weekly produce box that comes to my house. Often we eat them. Just as often I end up throwing them away because they’ve gone brown, waiting for me to finish all my other fabulous summer produce. 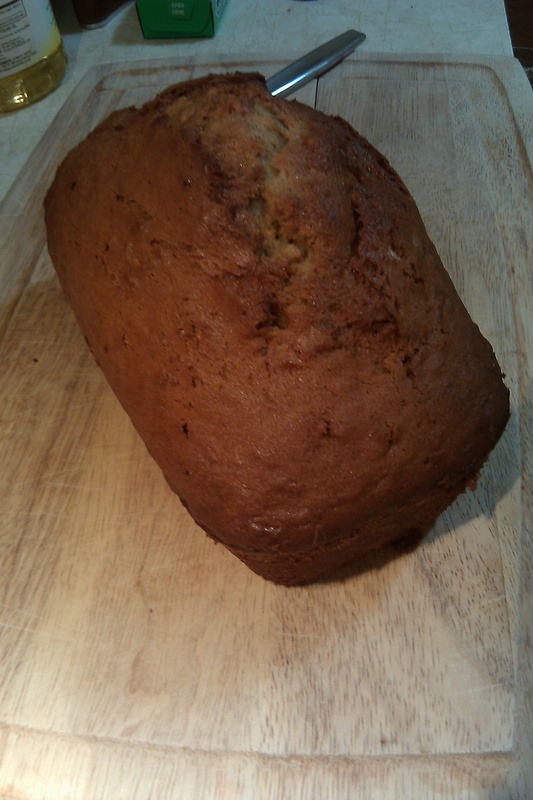 I decided yesterday that I was tired of throwing them away and that I would make banana bread instead. Now, this is really a rather revolutionary idea for me. I don’t really like bananas. I know, that is a crazy thing to say, but it is true. I like bananas when they are still a little green and don’t taste very banana like. When I was a kid (and even now), banana flavored candy was always my least favorite. There isn’t much that is grosser to me than artificial banana flavoring. However, I’ve had a few banana breads over the years that I’ve liked. One time, Phylicia Rashad offered me a piece of banana bread, and even though I wasn’t a big fan, how can you say no to Mrs. Huxtable!? More recently, a friend of mine brought me a piece that had carrots in it, and I quite liked it. So, when searching for a recipe to use my sad bananas for, I chose one with carrots. 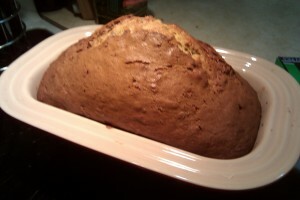 This is the beautiful loaf that I ended up with. Smelled even better than this looks. I found this on Allrecipes.com and the only change I made was using walnuts instead of pecans. I ended up cooking it for the full length recommended, and if anything, I overcooked it a bit. I don’t think you should wait quite until a toothpick in the middle comes out clean. Maybe a toothpick 1/3 of the way from the edge. But, I was the only one who thought it was a little dry, so maybe it was just perfect. I like that this banana bread was a) not too banana-y and b) not too sweet. It is simple and rich and lovely. 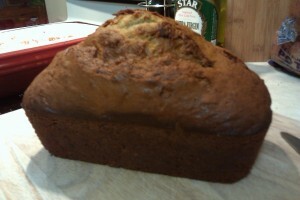 Not to mention, I had it in the oven and everything cleaned up in about 20 minutes. In a mixing bowl, combine oil and sugar. Add eggs; mix well. 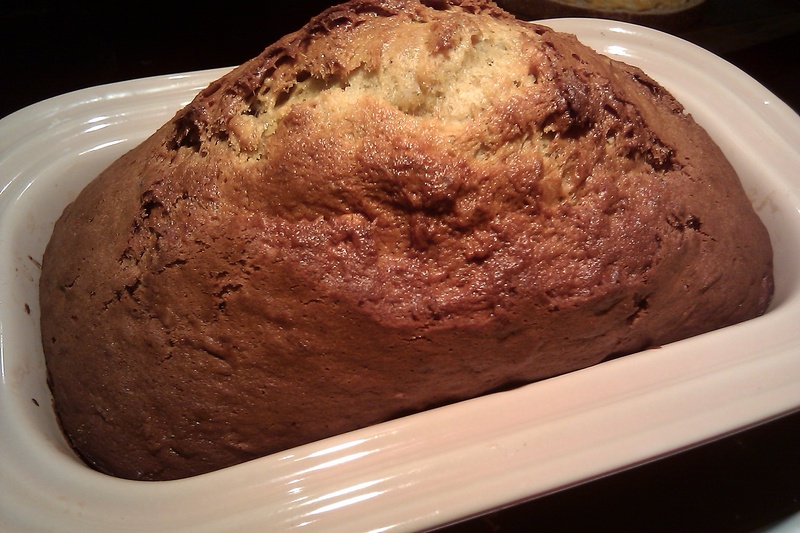 Combine flour, baking soda, salt and cinnamon; gradually add to the creamed mixture alternately with bananas. Stir in carrots and pecans. Transfer to a greased 9-in. x 5-in. x 3-in. loaf pan. Bake at 350 degrees F for 55-65 minutes or until a toothpick inserted near the center comes out clean. Cool for 10 minutes before removing from pan to a wire rack to cool completely. My wife and i ended up being so more than happy when Chris could finish off his survey via the ideas he had through the web page. It’s not at all simplistic just to continually be giving for free points which others may have been making money from. And we all fully understand we have got you to give thanks to for this. The most important illustrations you made, the straightforward web site navigation, the friendships you will help to instill – it’s got most remarkable, and it’s making our son in addition to the family understand this subject is awesome, which is truly pressing. Thank you for all the pieces! Pretty section of content. I just stumbled upon your site and in accession capital to assert that I get actually enjoyed account your blog posts. Anyway I all be subscribing to your augment and even I achievement you access consistently rapidly. Wow, fantastic blog layout! How lengthy have you been blogging for? you made running a blog glance easy. The full glance of your web site is magnificent, as neatly as the content material! Wonderful site. Plenty of helpful info here. I’m sending it to some friends ans also sharing in delicious. And naturally, thank you for your sweat!